​ The Knox Historical Society joins the Knox community in mourning the passing of Dan Driscoll. Dan and his family have lived in Knox for over 40 years and Dan was a true citizen of the town. He was happy to share his expertise for the improvement of our town and we have benefited from the many projects he oversaw. We have been very fortunate to have had someone of his caliber caring about our town. We extend our sympathy to his family. 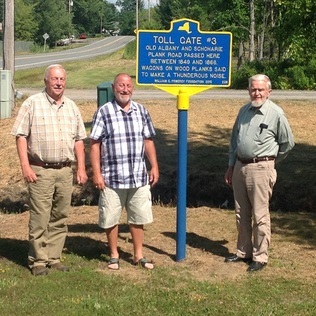 One of the many favorite projects Dan undertook with the Knox Historical Society was writing grants to obtain NYS Historic Markers for Knox. Through his efforts, 3 markers have been erected in recent years: Pillbox Factory, The Palatine Road, and Toll Gate#3. Dan also brightened up older markers in the town by repainting them. Maureen Driscoll admires the pastel painting by John R. Williams, Knox artist, of the Helleburgh Fife and Drum Corps. Depicted in the pastel are Paula Shafer, Nancy Frueh, and Maureen's late husband Dan Driscoll. The painting is part of a larger photo display in the Knox Town Hall vestibule honoring Dan who was the organizer and music master of the Corps, and other community members. Learn the history and view the photos for a limited time at the Knox Town Hall. 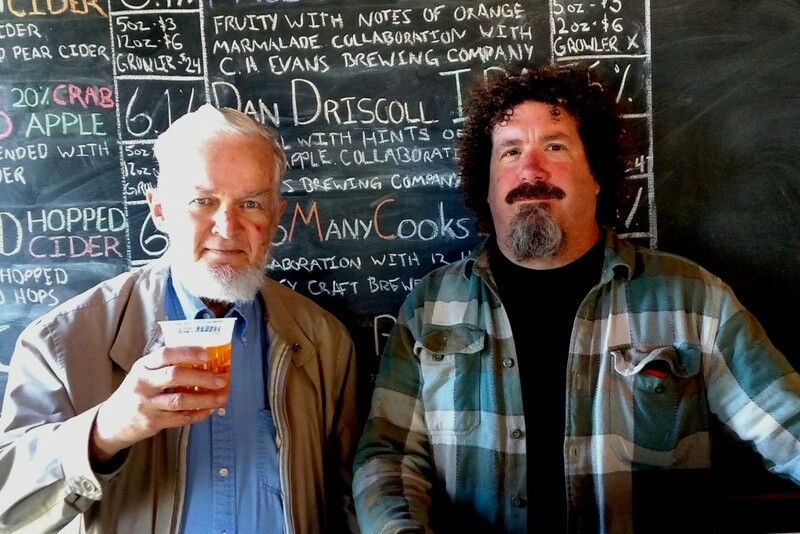 Knox “Renaissance Man”, Dan Driscoll, has another achievement to add to his life resume: a beer, the “Dan Driscoll IPA”, named after him. This honor is in addition to his career as an electrical, biomedical and noise control engineer, musician, fife and drum corps organizer, conservationist, history buff, gardener, planner, Knox Historical Society Trustee, to name just a few. But, how did this latest accolade come about? Dan started home-brewing beer around 1980. Dan did some research on hop growing in the Helderberg Hilltowns and discovered that hops, the ingredient that gives beer its flavor, had been a staple crop in the area 150 years ago. He wanted to use these heirloom hops in his home-brewed beer. Dan found out that retired farmer Earl Williamson was continuing to grow some of the original hops in his back yard in the hamlet of Berne. These hop plants may have come from the Shultes family, a family that had been farming in the Berne area since 1800. Earl gave some of the hop cuttings and rhizomes to Dan. Dan planted the rhizomes and cuttings in 1982 and began propagating them, continuing to tend them for many years on his property. Dan gave cuttings to several friends in the Hilltowns. In recent years Dan’s son-in-law in Portland, Oregon started home-brewing. Dan gave him some of the Helderberg Hops to cultivate. His son-in-law has brewed several batches of beer with the hops and also has used an historic recipe to brew Albany Ale. It should be noted that beer brewing is in Dan’s DNA. Dan’s great-grandfather, Joseph Laurer, was brewer/brewmaster at Genesee and Bartholomay breweries and started the Jos. Laurer Brewing Co. in 1892 in Binghamton, NY. Hops have been used in the production of beer since the 12th century in Germany and their use spread in the following centuries. Hops give beer a bitterness and flavor that balances the malt sugars and hops provide the resins that increase the “head”. 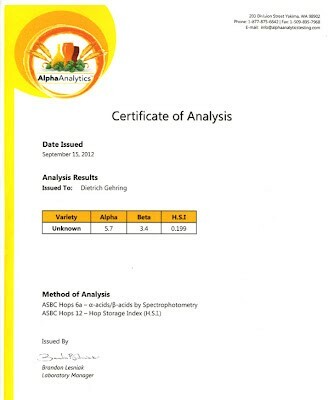 The hops also retard spoilage in beer because of antiseptics innate in the plant. In the spring the hop plant can be propagated from cuttings or from rhizomes. Similar to strawberry plants, the parent plant sends out runners which can be transplanted in hills 6 foot apart, in rows 7 foot apart. These plants will need 18-20 foot poles as they twine around the pole, growing rapidly from April to August. Botanically speaking hops are actually a “bine”, not a vine, using a strong stem and stiff hairs to climb structures. (Vines use tendrils and suckers to attach to structures.) During peak growing season they grow very rapidly, up to twenty inches per week. The huge bines are then cut down from the pole so that the flowers can be picked. It is the flower of the hop plant that is used in brewing. The cone-type flowers are pale green in color, firm, rounded, and the size of a walnut. These flowers can be harvested from August until frost. At the base of the flower are waxy, yellow lupulin glands that contain alpha acids responsible for bitterness and essential oils that give beer flavor and aroma. In the case of the “Dan Driscoll IPA” the Helderberg Hops give the beer a floral aroma with hints of pineapple. The Beebe Farm on Beebe Road in Knox was the largest hop farm in Albany County. The “old Lendrum Place”, now Altamont Rod and Gun Club on Quay Road was another homestead that specialized in the growing of hops. George and Joseph Haverly of Berne were also well-known hop farmers. Hop farms in the Helderberg Hilltowns ranged in size from one to several acres. Many farms had hop houses used for curing and storing the hops and housing the equipment. 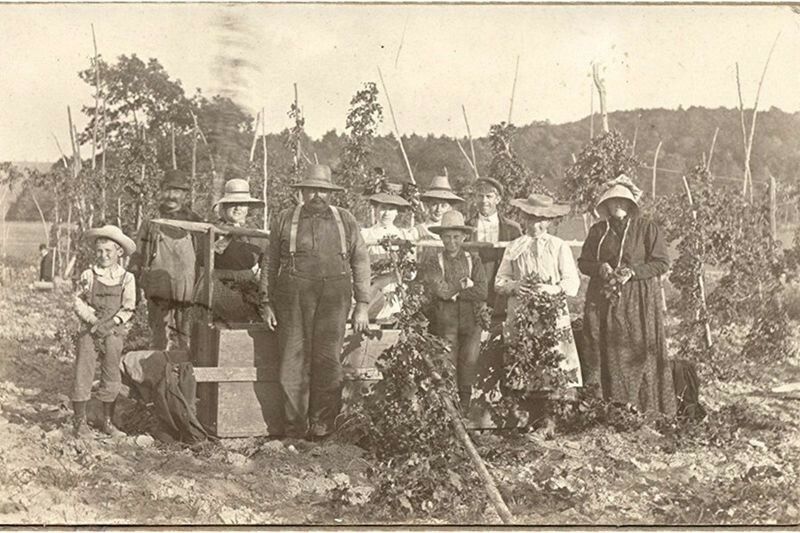 In the heyday of Helderberg hop growing, pickers were transported to the Hilltowns at harvest time by train and boarded at the hop farms. These migrant pickers joined the local populace in picking the hop flowers, carefully eliminating any leaves, and packing them into boxes 8’x4’ with a depth of 24 inches. The hops were then dried. After drying, the hops were pressed, baled, and shipped by wagon to local breweries or by train to more distant breweries. At that time Albany was one of the largest brewing hubs in the country, with breweries such as Hedrick, Dobler, and Beverwyck. The pickers worked long days but did find time to have fun. There were “hop jigs”, evenings of sing-alongs, and chicken roasts. In the 1886 edition of the Altamont Enterprise hop pickers, who were paid $.50 a box are quoted as saying they are “returning laden with shekels and a determination never to go hop picking again." The Helderberg hop industry declined due to powdery mildew disease and Prohibition. In recent years the craft beer industry, using local ingredients in the brewing, has become very popular. Dieter Gehring decided to start up a brewery and cidery at the Indian Ladder Farms, located below the Helderberg escarpment in the town of New Scotland. Dan gave Dieter several of his hop rhizomes. Dieter planted them in the brewery's hop yard and, acclimated to local climatic conditions, the hop plants grew well. Dieter had the hops tested and found out that these hops are cluster hops and are the “oldest hop variety grown in the U.S.”, truly heirloom quality. The brewery has made 3 varieties of beer to date using the hops. 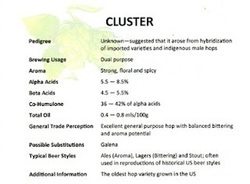 The first beer in the Hop Master Series is the “Dan Driscoll IPA”. The recipe was created by Greg Doroski and Joel Ford and the beer was brewed in collaboration with Threes Brewing in Brooklyn. The “Dan Driscoll IPA” will be on tap at the Indian Ladder Farmstead Brewery and Cidery beginning in May, on Thursdays through Sundays, and holiday Mondays, from 4 – 8 p.m. The hop plants can be seen growing at Indian Ladder Farmstead. They will be twining their way up the massive poles throughout the season. It is fitting that the heirloom Helderberg hops have found a new home in the local craft beer industry. Thank you, Dan, for preserving an important piece of the history of the Helderberg Hilltowns. And for contributing to a flavorful new beer!